Polymers, epoxies and acrylics have made stucco and terrazzo faster to install, more flexible, and able to handle colors that were once unimaginable. The Renaissance is a period in European history that was generally from the 14th to the 17th centuries. The time was considered the bridge between the Middle Ages and modern history. It started as a cultural movement in Italy and spread to the rest of Europe. In architecture, this period was marked by two distinct movements: reclaiming and restoring historical practices such as the rebuilding of St. Peter’s Basilica; and taking old traditional practices of the rectangular Gothic vaults and expressing new concepts to semi-circular and other artistic expressions. The word renaissance is of French origin and means rebirth or revival. Is it possible that future historians will look back to our time and call it a renaissance? While this may sound preposterous, there are signs of bringing back some construction practices and materials used in walls, ceilings and floors that were once considered all but dead. These materials and trades are having a kind of rebirth with a helping hand from modern science. Similar to the Renaissance in the 14th century, we are reviving old practices and adding a few twists that have created some excitement among designers, architects, interior designers and even artists. An even greater irony lies in the fact these rejuvenated materials are traditionally very Italian in nature. These materials were once staples of construction for Italy and can even be traced back to specific regions of that country. 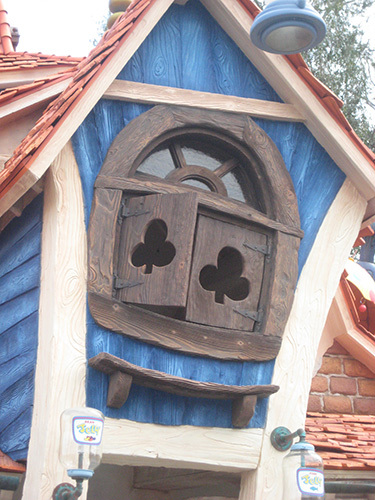 Cartoon-like details of this building in Disneyland were created with plaster.